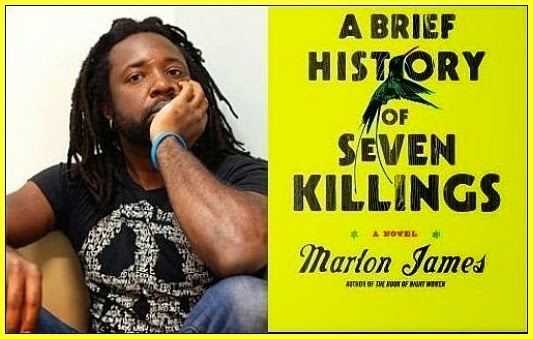 THEN AND NOW: A Brief History of Seven Killings, Marlon James' fictionalized account of a certain turbulent era in Jamaican and reggae history has been singled out by more than a dozen highly regarded publications and noted critics as one of the Top 10 Books of 2014. Most interesting of all, it currently ranks at #28 on Amazon.com's picks for the 100 Best Books released in the past twelve months, as selected by Amazon's editorial team, renowned for their exacting standards. It's a fantastic achievement for the gifted Jamaican storyteller (currently based in the States), who began making his mark among the global literati with acclaimed and provocative releases like John Crow's Devil and The Book of Night Women — works steeped in Jamaica's rich cultural heritage and delivering narrative pulsing with life and emotion. Small wonder that in anointing Seven Killings as one of the finest pageturners she picked up this year, Michiko Kakutani, The New York Times' notoriously acerbic chief book critic, describes it as "musical, electric and fantastically profane..... an epic that explores the tumultuous world of Jamaica over the past three decades." In addition to making Amazon's and The New York Times' cream-of-the-crop year-end lists, Seven Killings was also honored by the Washington Post, the Chicago Tribune, the Boston Globe, the Huffington Post, Newsweek, Time and the Houston Chronicle. CHAPTERS OF HER LIFE: Any new release by enduring Jamaican author Erna Brodber is cause for celebration, so colour us happy to learn that her latest work, a novel titled Nothing's Mat, is slated to arrive in bookstores this month from the UWI Press, who published Olive Senior's historical epic Dying to Better Themselves to much acclaim a few months ago. At a modest 128 pages, Brodber's latest sounds like a pretty slim volume, but judging by the publisher's weighty description of the tale it chronicles, there's considerable heft within the seemingly tiny framework. Moving between the United Kingdom and Jamaica, Nothing's Mat follows Princess, a black British teenager whose education, both academic and sociological, awakens her to the ways of the world. Readers are also introduced to members of her immediate family (father, grandparents, cousins) who help shape Princess' coming-of-age experiences in profound and deeply meaningful ways. Then there's the family history that she painstakingly weaves into a special mat that becomes her shield against evil forces, spiritual and physical. Folklore, superstitions and healthy servings of fantasy-meets-magical realism, family dynamics and relationship arcs consistently play important roles in Brodber's work. (See Jane and Louisa Will Soon Come Home, Myal and The Rainmaker's Mistake.) By all accounts, a quixotic blend of these and other themes help connect the dots in Nothing's Mat, clearly a must-read new novel packaged as "a fictional family history and a comment on anthropological methodology and African systems of thought."